Join artist Emily Miller for an interactive art installation and daily performance with 600+ pounds of "ghost net" fishing rope debris. I'll be working in the gallery throughout the exhibit, making baskets on my sewing machine. Sign up below to help transform even more ghost net into artwork! 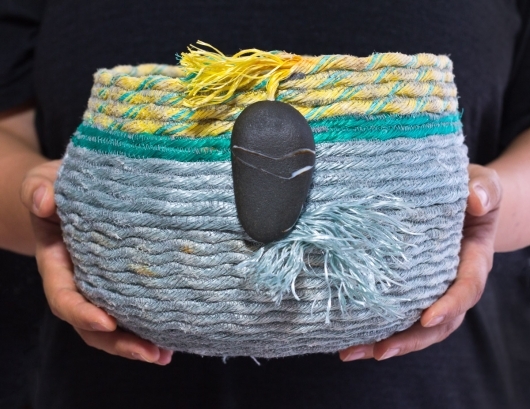 CREATE — Starting in May: Untangle and unwind fishing rope... Take home materials... Explore a new material to make art... Lead collaborative work in your specialty! What days and times can you join us? Featured artist collaborations announced soon! Ghost net is one of the most abundant and dangerous sources of marine debris in our oceans. This lost or abandoned fishing gear makes up 46% of the mass in the Great Pacific Garbage Patch, where it entangles wildlife and disintegrates into microplastics, affecting every level of the food web and marine ecosystem. Since 2015, I have created machine-stitched baskets from this fishing rope washed up on the coastlines of Oregon, Kauai, and Maine. The collection site of each rope tells its own unique story about the effects of coastal industry on local and global scales. In 2018, I pulled rope from a massive environment created from two tons of ghost net, hauled off Kauai's beaches by Surfrider Kauai in just two months. This experience directly inspired the Ghost Net Landscape installation. By bringing the pile into the gallery, the project shares its powerful physical presence - a small fraction of what washes ashore every day. What happens to the material after it is removed from the ocean is a work in progress. Ghost Net Landscape seeks to discover how much artwork I can create from the mass, and to show how much more can be done when we work together. Worldwide, I've seen a variety of evolving solutions. Companies are melting down ocean plastic for use in products like skateboards, shoes, and building bricks. Some places (including Hawaii) incinerate it in modern waste-to-energy facilities. And more and more artists are taking advantage of marine debris in their work! Find the full story on my website at ejmillerfineart.com/sculpture/ghost-net-baskets. Sponsor a basket now for summer delivery! Basket sponsorships fund the transportation and processing of materials, as well as artist fees for three months of work. I gladly consider requests to include specific colors in your basket, but cannot guarantee availability, as it all depends on the rope that I find. Join the team to help support this project with materials, manpower, facilities or funding! © 2019 Emily Miller fine art - Ocean-inspired artwork from Oregon & Kauai.